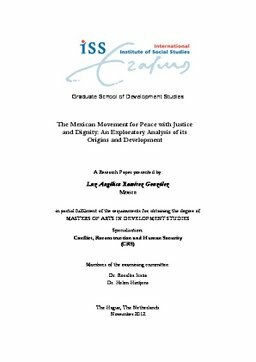 This research studies the development of one of Mexico’s most significant social processes of the last year: the Movement for Peace with Justice and Dignity (MPJD). The 28th of March 2011, the well-known Mexican poet Javier Sicilia lost his son to the so-called ‘war on drugs’ flagged by President Felipe Calderón1. Soon after his loss, Sicilia (2011) publicly expressed the pain, suffering and indignation caused by the outcomes of the government’s strategy and made his message clear: “estamos hasta la madre” (we are fed up). He called upon the citizenry to unite and demand peace with justice and dignity. Since that moment thousands of people throughout the country and a number of national as well as international organisations have reacted to his call and today they form the MPJD. This research explores how the MPJD has developed since the time of its emergence by applying a rather fluid theoretical perspective that incorporates rational as well as emotional aspects of collective action. Moreover, by focusing on what happens within the movement, this study aims to highlight the voices and agency of those whose experiences have been marginalised. A key finding is that whilst the MPJD has not managed to advance agendas of peace and justice, it has been able to counter an official discourse and made the victims of Mexico’s dramatic escalation of violence significantly more visible.